Our paper on comparing bison diet between Kansas and South Dakota came out today. 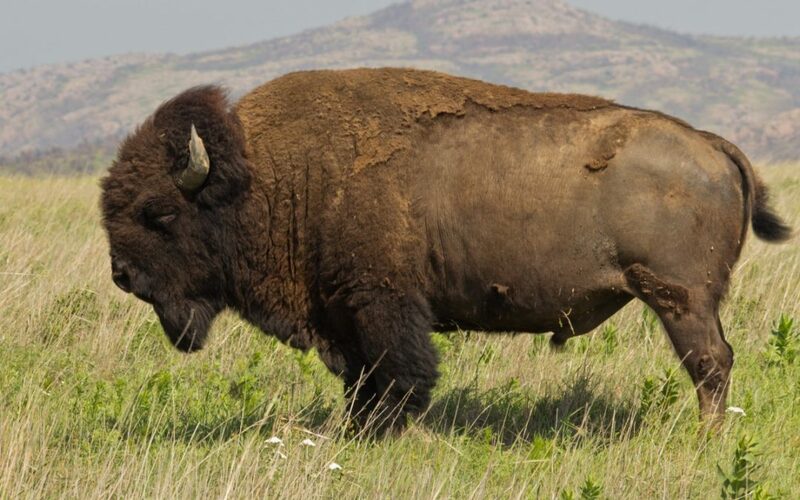 There are a number of interesting patterns in there about the diets of bison. We’re seeing bison eat a lot more forbs and legumes than had been previously assumed. We’re also seeing consistent patterns in plant species consumption across years. One question we get is “How quantitative is this approach?” In short, can we interpret the percentage of sequences for a given species as a proportion of their intake? From first principles, since the sequence we use is from chloroplasts and chloroplast density in a leaf tends to scale with N concentrations in the leaf (and leaf N and leaf protein scale), we’ve assumed that the percentage of sequences for a species was proportional to the percentage of protein from a species consumed by the herbivore. For example, if an herbivore consumes to plants in equal proportions and the plants have the same N concentrations, then we expect a 1:1 split on the sequences. But, if one of those species had twice the N concentration of the other, we expect a 2:1 split on the sequences. One way to test this is with feeding trials. These are coming up. In the mean time, across all our bison samples for the project we examined the C isotope ratio of the fecals and the % sequences from C4 grasses. C4 grasses have a unique isotopic signature and C isotopic ratios are a good index of the proportion of intake from C4 plants. Turns out the relationship is pretty strong. Animals that isotopically appeared to be consuming more C4 grasses also had a higher proportion of C4 grass reads. As far as we can tell, some of the scatter around the line (and the deviation from a 1:1 slope) is caused by the typically lower N concentration of C4 grasses than other plants. Another way to think about it is that the C isotopes are indicating what proportion of the animal’s C comes from C4 plants and the sequence data tells you what proportion of its N came from C4 plants. Still, all in all, pretty strong evidence for interpreting the sequence data as representing diet. **Craine, J. M., E. G. Towne, M. Miller, and N. Fierer. 2015. Climatic warming and the future of bison as grazers. Scientific Reports 5:16738.